Hi loves! Today I have a fun nail art review to share with you, as it features both the Bundle Monster Shangri-La Master Set and the 4 piece Semi Squishy Silicone Mega Stamper and Scraper Card Set. I received these a while back but just didn't have the time to do a few looks to share with you. Luckily, I finally found some time and came up with 3 nail art looks! Let's start with some more info. The Shangri-La Master Set consists of 10 square plates, with a buffet-style design. You can literally use every little bit of the design creating a unique look every time you grab one of these plates. The designs are nice and varied between the plates, ranging from finer-lined designs with a lot of swirls to more bold and structured designs on others. I didn't have any issues picking up the designs and made sure to test both fine and bold lines. Even though the plates are square, they still fit perfectly in my Bundle Monster organizer. The plates have a paper backing and the regular blue foil on the front that has to be removed before using them. Along with these plates I tested the 4 piece Semi Squishy Silicone Mega Stamper and Scraper Card Set. I think it's fun that not only stampers have developed from the regular ol' Konad stamper to many new variations, but also that the scrapers you use have now been updated with funky prints. The scrapers that come in this set are the more stiff, credit card like scrapers. I prefer a bit more movement in my scraper so I didn't use these, but they sure look cute! The stamper itself seems to be about the same size as the Creative Shop Stamper. I used the white stamping head, first I buffed it lightly, ran across the surface quickly with some acetone then used a lint roller to clear up any last bit of dust. It stamps perfectly! I love these big stamper heads because you don't have to worry as much about positioning, and with image plates that have a full design it becomes even easier. Bundle Monster S101 offers nice, thin lines and fluid designs. I started with a base of Cirque Colors Memento Mori and stamped using Glam Polish Opulent. I was already curious if it would stamp and it does ^^. 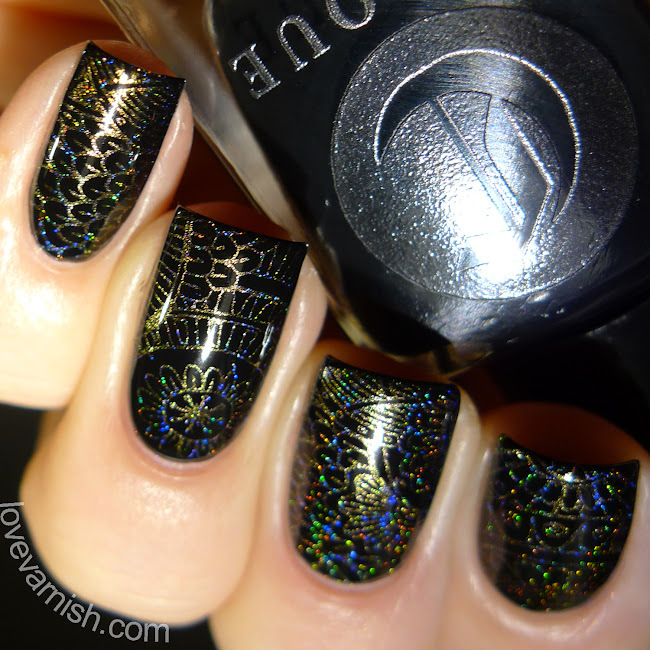 The holographic sparkle was really INSANE with this design! All the fine lines transferred perfectly. Bundle Monster S104 has some bolder lines and floral designs. I started with a base of Dance Legend Gel Effect 1046, then used Dance Legend Gel Effect 1045 and a small piece of sponge to add random spots of polish. Because it looked a bit stark, I did another round of sponging using the lightest shade again and then stamped with Konad White. Such a cute design! Bundle Monster S110 has bolder lines and more `square` designs. I started with a base of Ginger Polish Singing in the Rain and stamped using Cirque Colors Memento Mori. I love how this design is bold and stark yet still allows the basecolor to shine through! Both the Shangri-La Master Set and the 4 piece Semi Squishy Silicone Mega Stamper and Scraper Card Set are a great addition to my stamping stash. I am happy the image plates aren't off in size so I can store them easily, and all designs picked up very well. 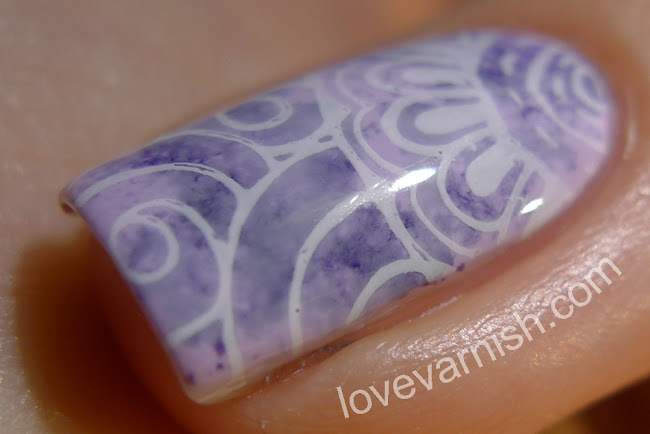 The stamper is great quality and squishy enough to wrap around my curvy nails. Have you tried either of these items? And what do you think of my designs? Tell me in the comments!